Are you a Spurs fan? Have you followed the team’s progress during the 2015/16 season, one of their most successful and exciting of recent times? 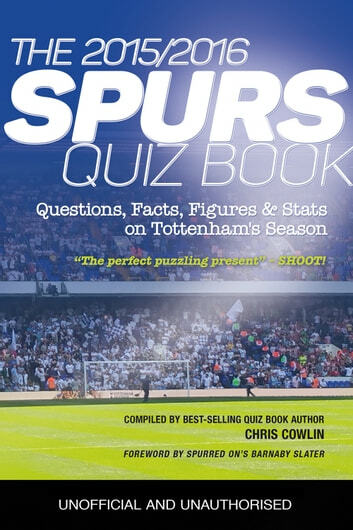 Maybe, like bestselling quiz book author, Chris Cowlin, you have been lucky enough to attend several of the 2015/16 season’s matches? Or, perhaps, you have been glued to the TV watching Spurs magnificent performances from home? 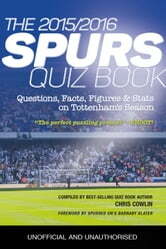 However you supported Tottenham during the 2015/2016 season, you are certain to enjoy reliving all those golden moments with The 2015/2016 Spurs and Fact Quiz Book.Containing 100 questions to test your memory on all aspects of the club including the League Season, the Europa League, squad numbers, transfers, the League and FA Cups and manager Mauricio Pochettino as well as 100 fascinating facts on Spurs 2015/2016 season, this is a book no Tottenham fan will want to be without.With a foreword by Barnaby Slater, producer of SpurredOn, and details, facts and figures on all the highlights of the 2015/2016 season, this is a must-have book for Spurs fans of all ages.